I rarely bake. No. I take that back. I NEVER bake. Bakegoods to me is whatever I pick up from Starbucks and honestly that has got to cease because Starbucks is expensive! Now that the weather is getting nippy and the leaves are colorfully littering the streets, I finally feel the holidays coming. This Thanksgiving and Christmas I want my daughters to get that real holiday feel where they smell cakes in the oven and see pies cooling on the countertops. That’s what I grew up with. My father always cooked the most delicious cakes and pies. He took pride in it. So this year I’m going to replicate what I had as a child for my daughters. As long as I follow the recipe I should be fine, right? 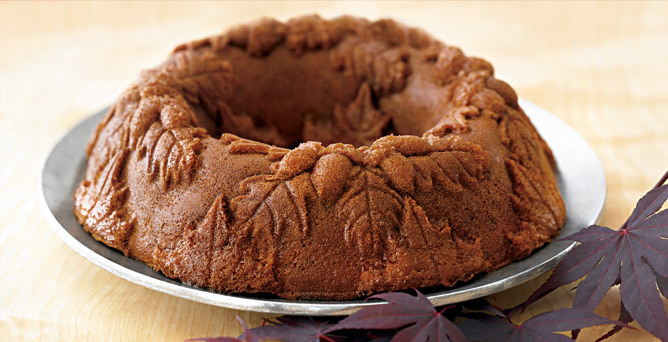 I saw this beautiful Autumn Leaf Bundt cake tin from William Sonoma and I think it’s absolutely gorgeous. If I’m going to make a cake I’d love for it to at least be creative and beautiful as well as delicious. The Bundt pan is a little steep at $34.00. I’m sure it will last forever, though.